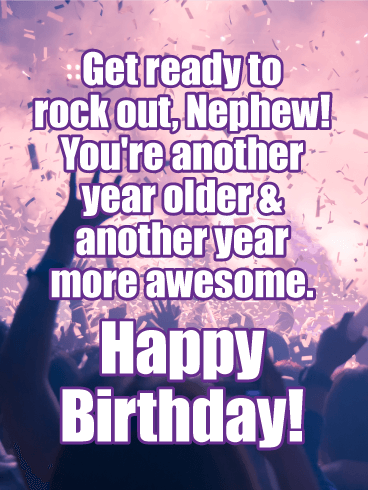 Happy Birthday Nephew! 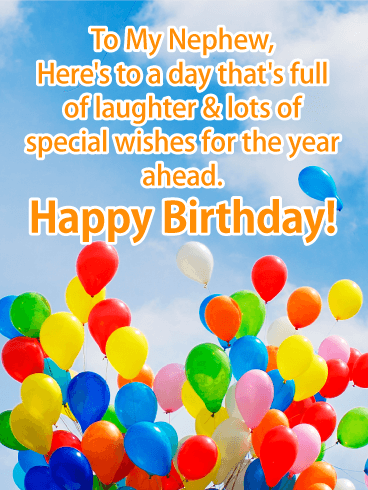 I hope you have lots of wishes rolling in as you celebrate another year of being totally cool. Who needs dozens of candles on the cake when just one can have such a powerful result? Big birthday wishes deserve big birthday candles. 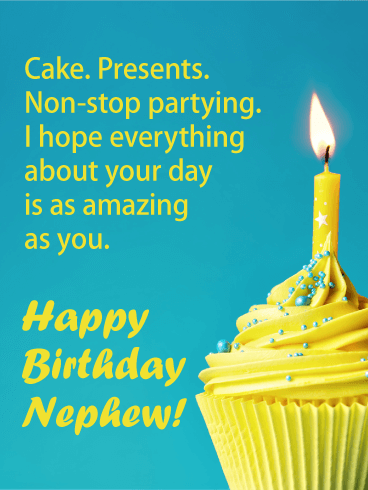 Send your nephew a card that contains the biggest birthday wish of all - that he has a long, happy life. Complete with a fast sports car. Your nephew is an incredible person who deserves an incredible life. 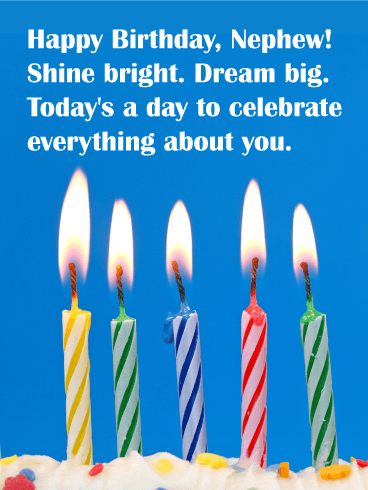 Be a part of that by sending the perfect birthday card. Birthdays are even better with cake and lots of wishes from family and friends. 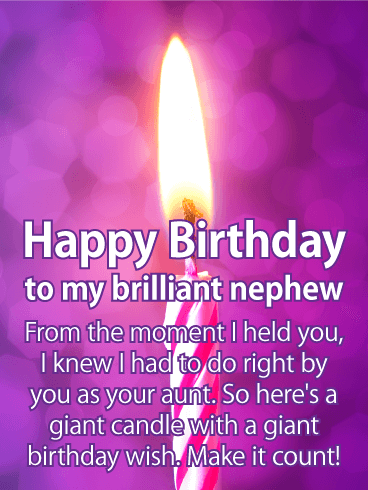 This year, make your nephew feel loved and remembered by sending this birthday card, which is full of all these iconic symbols that make celebrating so special. It's a chance to let him know you're thinking of him while also reminding him just how amazing he is. What do you get the coolest person you know? The guy who has all the latest things? It's not the gadgets that make a birthday, it's knowing you're loved, supported, and thought of. It's celebrating while knowing that everyone by your side cares for you. 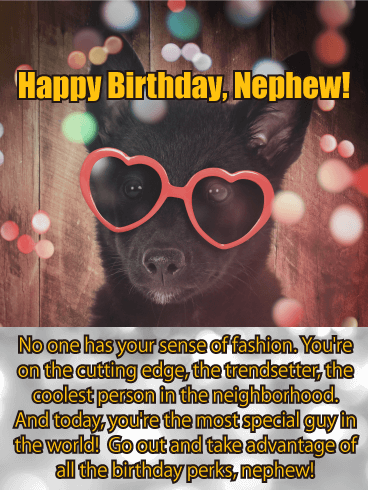 Let your nephew know that today, he's in your heart and that you think he's the best guy in the world. Make him blush with praise and give him the perfect birthday gift - your love. The lights are on. The guests have arrived. 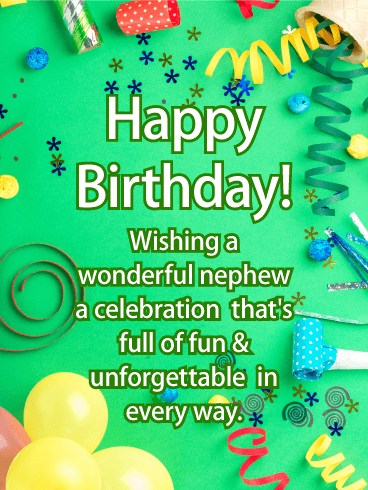 It's time to celebrate your nephew's birthday in the most memorable way! 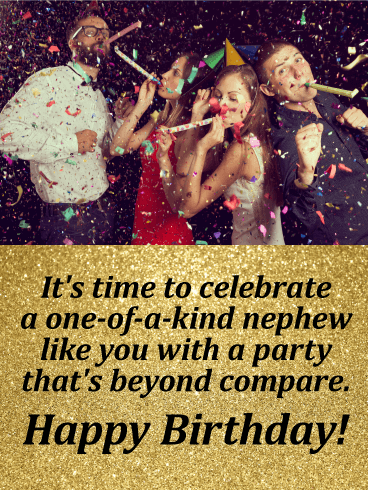 This festive birthday card features a party setting in the background, the perfect chance to remind him that he deserves the best birthday ever because he's so unique and special to so many people, including you! Birthdays are the days we can get away with a lot of things. "It's my birthday" are the magic words that makes thing happen - either in getting what you want or as an explanation for what you're doing. 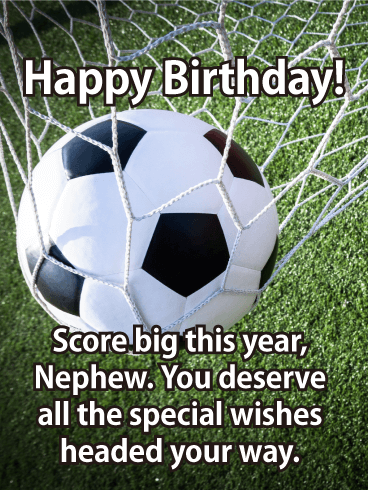 Support your nephew taking full advantage of that yearly gift with this birthday card! 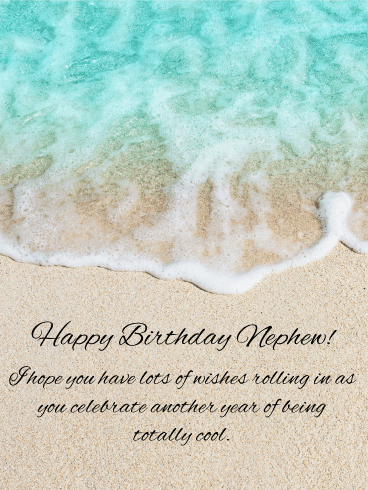 This opportunity to live life to the fullest only happens once a year - help your nephew make all his birthday wishes come true with this birthday card! 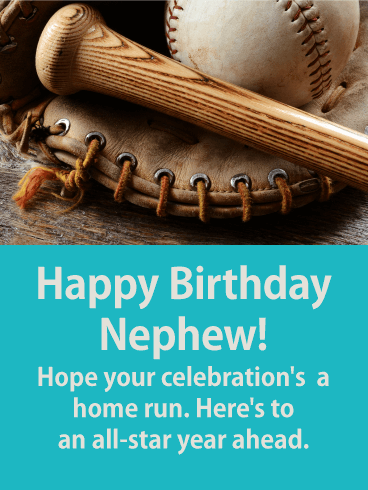 Your nephew is an MVP in your eyes, so hit one out of the park this year by sending him this fun baseball-themed birthday card! A baseball sits inside a glove, with a "Happy Birthday" message proudly displayed. Below are your own words, wishing him a home run celebration and an all-star year ahead. He'll feel like a winner for sure, not only today, but for a long time to come. Make his day explosive! Your nephew has always been a firecracker, but that's a good thing. 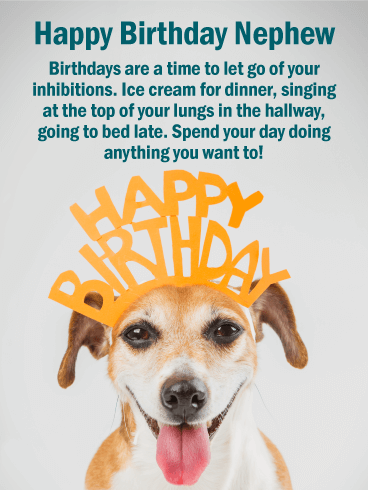 This card gives you the chance to turn the tables and make his birthday fun and unforgettable - just like every day he spends with you. 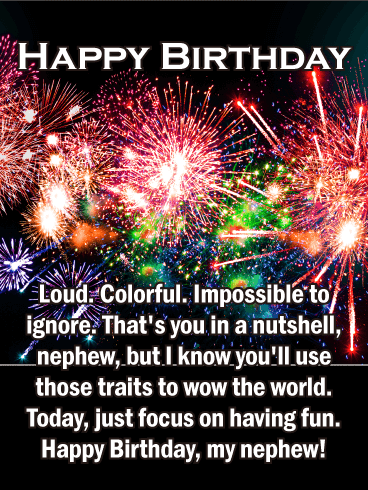 Fill the day with wonder and awe with these fireworks, thanks to this birthday card! He'll remember it for ages.